Ryan Stanek – RHP – Arkansas – Jr. 3IP 4H 2ER 2BB 4K. Underwhelming performance. Jonathon Crawford – RHP – Florida – Jr. 5.1IP 0H 2ER 2BB 4K. (L, 0-1). Tough luck getting a loss without giving up a hit. Daniel Gibson – LHP – Florida – Jr. .2IP 1H 1ER 0BB 0K. Bobby Wahl – RHP – Mississippi – Jr. 5IP 2H 1ER 6BB 4K. (W, 2-0). Kevin Ziomek – LHP – Vanderbilt – Jr. 7IP 5H 1ER 2BB 11K. (W, 2-0). Jerad Grundy – LHP – Kentucky – Sr. 7IP 3H 1ER 2BB 3K. (W, 2-0). Will be drafted for a 4th time this year. Possibly before the 10th round. 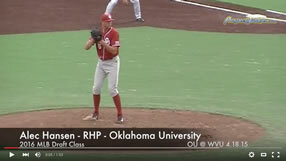 Jacob Lindgren – LHP – Mississippi State – So. 5.1IP 3H 1ER 0BB 6K. Mark Appel – RHP – Stanford – Sr. 9IP 3H 1ER 1BB 11K. (W, 1-1). Bounce back performance. Adam Plutko – RHP – UCLA – Jr. 6IP 5H 1ER 2BB 2K. (W, 1-0). James Kaprielian – RHP – UCLA – Fr. 1IP 1H 1ER 2BB 3K. (S, 1). One of the top freshman arms in the country. Trevor Williams – RHP – ASU – Jr. 7IP 3H 0ER 1BB 8K. (W, 1-0). Jake Reed – RHP – Oregon – So. 5IP 6H 4ER 0BB 8K. (L, 1-1). Konner Wade – RHP – Arizona – Jr. 7.2IP 9H 6ER 1BB 5K. Austin Voth – RHP – Washington – Sr. 7.2IP 5H 2ER 1BB 14K. (W, 1-1). Justin Jones – LHP – California – Sr. 4IP 6H 2ER 0BB 4K. 7th round pick out of high school (CHW) has had up and down college career. Dillon Overton – LHP – Oklahoma – Jr. 8IP 7H 0ER 0BB 9K. (W, 3-0). Brandon Finnegan – LHP – TCU – So. 4.2IP 3H 2ER 4BB 3K. (L, 0-1). Parker French – RHP – Texas – So. 6.1IP 8H 2ER 1BB 6K. (W, 2-0). Corey Knebel – RHP – Texas – Jr. 2IP 1H 0ER 2BB 6K. (S, 2). Recorded all six outs via the strikeout. Trae Davis – RHP – Baylor – Jr. .1IP 0H 0ER 0BB 1K. Frank Duncan – RHP – Kansas – Jr. 7.2IP 2H 0ER 0BB 3K. 6K. (W, 1-0). Chad Green – RHP – Louisville – Jr. 7IP 1H 0ER 1BB 3K. (W, 1-1). Kyle Funkhouser – RHP – Louisville – Fr. 2IP 2H 0ER 0BB 3K. Sean Fitzgerald – RHP – Notre Dame – Jr. 6.1IP 4H 1ER 0BB 2K. (W, 1-0). Dan Slania – RHP – Notre Dame – Jr. 1.2IP 2H 0ER 1BB 1K. (S, 1). Austin Kubitza – RHP – Rice – Jr. 7IP 4H 0ER 5BB 13K. John Simms – RHP – Rice – Jr. 3IP 2H 0ER 2BB 5K. (W, 2-0). Ben Lively – RHP – Central Florida – Jr. 7IP 3H 1ER 3BB 6K. (W, 2-0). Tony Rizzotti – RHP – Tulane – So. 6IP 4H 2ER 2BB 6K. (L, 1-1). Tough luck loss against Notre Dame and fellow prospect, Sean Fitzgerald. Sam Moll – LHP – Memphis – Jr. 7IP 1H 0ER 1BB 5K. (W, 1-1). Thomas Eshelman – RHP – Cal State Fullerton – Fr.. 5.2IP 3H 0ER 0BB 8K. (W, 2-0). Scott Squier – LHP – Hawaii – So. 7IP 4H 0ER 1BB 9K. Was great in 17 inning duel with Kubitza and Rice. Andrew Thurman – RHP – UC Irvine – Sr. 6IP 5H 3ER 1BB 9K. Shane Carle – RHP – Long Beach State – Jr. 7IP 7H 1ER 1BB 6K. (W, 1-1). Tyler Linehan – RHP – Fresno State – Jr. – .1IP 1H 2ER 3BB 0K. (L, 0-2). Michael Wagner – RHP – San Diego – Jr. 7IP 6H 1ER 2BB 5K. Converted closer. Marco Gonzalez – LHP – Gonzaga – Jr. 7IP 6H 1ER 2BB 8K. (W, 1-1). Scott Frazier – RHP – Pepperdine – Jr. 6.2IP 7H 3ER 2BB 8K. Unsigned 5th round pick in 2010 (PHI). Colin Welmon – RHP – Loyola Marymount – So. 6IP 4H 0ER 3BB 9K. Abe Bobb – RHP – San Francisco – Jr. 3IP 5H 5ER 1BB 1K. (L, 0-2). Kyle Finnegan – RHP – Texas State – Jr. 5IP 3H 1ER 4BB 9K. (W, 1-0). Jake Johansen – RHP – Dallas Baptist – Jr. 8.1IP 1H 0ER 2BB 10K. (W, 1-1). Tom Windle – LHP – Minnesota – Jr. 5.2IP 3H 0ER 2BB 4K. (W, 1-0). Possible 1st round pick. Brad Schreiber – RHP – Purdue – Jr. 6IP 4H 3ER 2BB 2K. Tyler Skulina – RHP – Kent State – Jr. 8IP 2H 0ER 2BB 8K. Brian Clark – LHP – Kent State – So. 0IP 1H 0ER 0BB 0K. Jordan Foley – RHP – Central Michigan – So. 6IP 2H 0ER 3BB 8K. (W, 1-0). Dylan Rheault – RHP – Central Michigan – So. 2.1IP 3H 2ER 1BB 1K. Sean Manaea – LHP – Indiana State – Jr. 6IP 1H 0ER 2BB 10K. John Straka – RHP – North Dakota State – Jr. 7IP 5H 0ER 1BB 5K. (W, 2-0). Layne Somsen – RHP – South Dakota State – Sr. 6IP 5H 1ER 2BB 7K. (L, 0-1). Lee Ridenhour – RHP – Austin Peay – Sr. 6.1IP 4H 1ER 2BB 6K. (W, 2-0). Alex Gonzalez – RHP – Oral Roberts – Jr. 7IP 7H 2ER 1BB 11K. (L, 0-2). AJ Longoria – RHP – Texas A&M Corpus Christi – Jr. 2IP 2H 0ER 0BB 1K. TJ Renda – RHP – Alabama State – So. 7IP 4H 0ER 1BB 5K. (W, 2-0). Cale Wine – RHP – Louisiana Monroe – Sr. 9IP 9H 1ER 0BB 7K. (W, 2-0). Chris Anderson – RHP – Jacksonville – Jr. 7IP 4H 2ER 2BB 9K. (L, 0-1). Drafted in the 35th Round in ’10 (CHC). Ricky Knapp – RHP – Florida Gulf Coast – Jr. 9IP 6H 2ER 0BB 4K. (W, 2-0). 44th round draft pick (DET) in ’10. Anthony Montefusco – RHP – George Mason – Jr. 5IP 4H 1ER 2BB 7K. (W, 1-1). Kyle McGowin – RHP – Savannah State – Jr. 7IP 4H 0ER 1BB 11K. (W, 1-0). James Norwood – RHP – Saint Louis – So. 6IP 7H 0ER 2BB 9K. (L, 1-1).